The exhibtion of works by Jamelie Hassan, a Canadian artist of Lebanese descent include two early multi-media works, Trilogy and Meeting Nasser and the recent work Two Woman in One. The works reflect Hassan's enduring interest in text, language, memory, personal history, and identity to address the critical issues of our time. January 30 | Lecture by Jamelie Hassan at the Emily Carr Institute of Art & Design, Room 260. A collaborative bookwork by j.hassan and j. ismail. 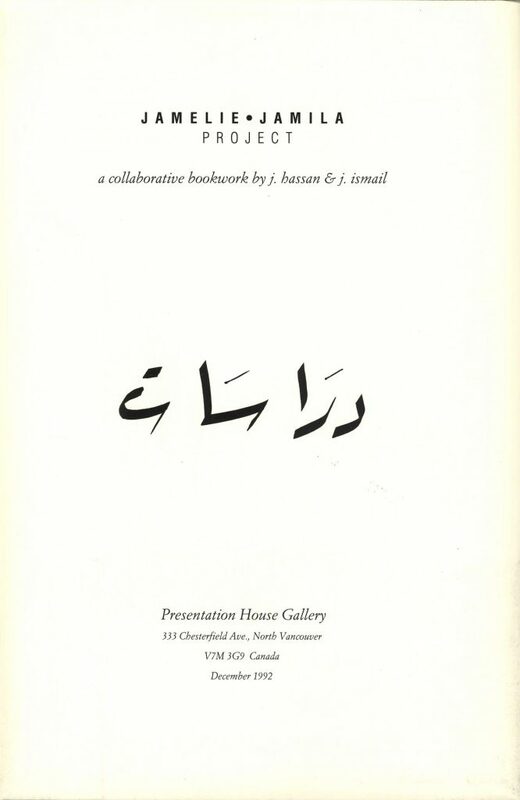 The bookwork was produced in connection with the 1991 exhibition Two Woman in One: Jamelie Hassan. Design concept: Jamelie Hassan and Jamila Ismail. Design development and production: Alex Hass, Hodgson + Hass. Printed by Gastown Printers, Vancouver.